The 1848 Liberty Seated quarter has long been a favorite coin of mine. Reviewing reference materials, the Heritage archive, and the population reports in preparation for this column has reminded me why. The reported mintage of 146,000 would certainly lead one to expect that survivors would be scarce; but in a series where a great many dates are at least scarce, that does not make the issue particularly special. Yet, it is a special coin – and one that is not always recognized as such by collectors. The 1848 is, arguably, the rarest Philadelphia seated quarter in mint state. 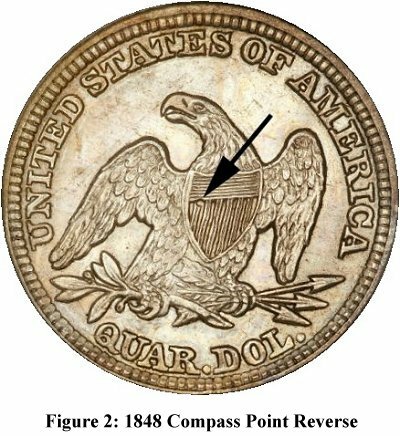 It is one of the keys to a set of Philadelphia seated quarters in any grade, and with no New Orleans quarters produced during the year it is also a key to a date set. The higher grade the set, the more “key” the 1848 becomes. 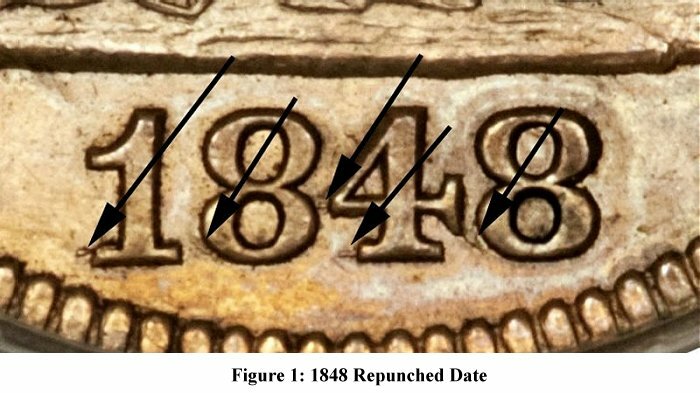 This is particularly true because estimates put the number of proof 1848 quarters at 8 to 10 so that, unlike the scarce and rare later Philadelphia issues, there aren’t proof examples providing another option to collectors inclined to add proofs to their set in place of mint state business strikes. Briggs’ estimated rarity of the 1848 quarter as R5 (31-75 known) in XF/AU and R7 (4-12 known) in mint state. There were 34 examples reported by LSCC club members in the 1993 survey. Only one of those examples was mint state and only 3 were AU; eleven examples were reported in XF. The 2007 survey featured 46 examples – 3 in MS, 9 in AU, and 14 in XF. The grading services (PCGS and NGC) have certified 74 examples in all grades, with 21 of those in mint state. There have been only 9 mint state 1848 quarters certified by PCGS, ranking it first in rarity amongst the P-mint quarters (in mint state and in PCGS holders). Only five other P-mint quarters have fewer than 18 mint state examples certified by PCGS: 1869 (11), 1842 (12), 1850 (14), 1840 (15) and 1846 (17). 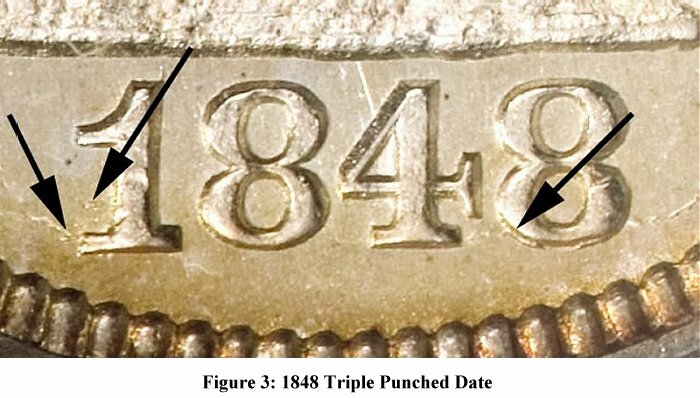 Another interesting feature of the 1848 quarter is that it comes with two, and only two, die pairings - both featuring repunched dates. Briggs 1-A pairs an obverse with a double punched date (Figure 1) with a reverse having the so-called “compass point” defect in the eagle’s shield (Figure 2). Briggs 2-B pairs an obverse with a triple punched date (Figure 3) and a reverse that does not have the “compass point” defect. There are no known examples of 1-B or 2-A die pairings, nor are there any known examples without a doubled or tripled date. Briggs states that the 1-A die pair is the scarcer of the two. This is contradicted by the LSCC surveys showing that the doubled date outnumbered the tripled date 25 to 9 in 1993 and 32 to 14 in 2007. Personally, I found that the tripled date was much more difficult to find than the doubled date in XF/AU. Once I purchased the AU tripled date that is now in my collection, during 2008, it seemed like they were suddenly available and the doubled date far harder to find than the tripled date die pair. Another observation that I have made is that the two varieties tend to appear in closer to even numbers in higher grades, such as Choice XF and better. Though there is relatively little hard data to support this opinion, the larger number of doubled date examples appears to be mostly due to larger numbers of lower grade specimens. The 2007 survey reported each variety by grade, listing 7 doubled date examples in AU and MS versus 5 tripled date examples in the same grade range.